Bin Tag is specially designed for automatic garbage collection. The RFID waste bin tag can be installed inside or outside a trash can. It can be read by an RFID reader which is utilized by the drivers in collection trucks. It aims to improve efficiency, especially if it programmed a unique number associates a garbage cart with an address. The RFID waste bin tag is also a possibility for loyalty and reward programs offered to residents. HUAYUAN’s RFID Waste Bin Tags are available in 125KHz, 134.2KHz, 13.56MHz and UHF 860-960MHz. RFID Worm Tag offers superior resistance to water, salt mist, mineral oil and petroleum, as well as high tolerance to shock and temperature variations. Each tag installs easily into standard nests, manufactured into most waste bins, including metal bins and DIN 30745 plastic bins. 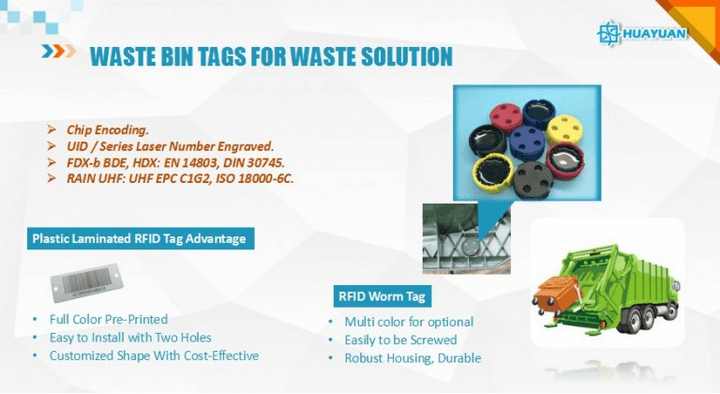 PVC Waste Bin Tag is a flexible solution to waste management. It is a PVC lamination product whose dimension is customized. Two holes on each side allow the tag easily installed.